Ambrose Bierce was born in Meigs County, Ohio, the tenth of thirteen children of Marcus and Laura Bierce. Each of the children was given a name beginning with the letter "A." Bierce grew up on a farm in northern Indiana. After studying a year in a high school Bierce became a printer's apprentice on The Northern Indianan, an antislavery paper, at the age of fifteen. After a term at a military school, he worked in a combination store and café. In 1861, he enlisted in the army and served as an officer in the Union Army until 1865 - an experience that was crucial for his life and career as a writer. Bierce was a topographical officer on General William B. Hazen's staff. He fought in several battles including the one that later provided the setting for 'Chickamauga' (1889), one of his best stories. At Kenesaw Mountain, Bierce was wounded in the temple and the bullet lodged within his skull behind his left ear. After the war Bierce settled in San Francisco. He found employment as a watchman at the U.S. Sub-Treasury and began his journalistic career. Bierce contributed to a number of periodicals, including the Overland Monthly and the Californian. In 1868 he became the editor of the News Letter. His first story, The Haunted Valley, appeared in 1871 in the Overland Monthly. After his marriage to a wealthy miner's daughter, Mollie Day, Bierce went to England. He lived in London from 1872 to 1875, and wrote sketches for the magazines Figaro and Fun. During this time he published three volumes of sketches and epigrams: The Fiend's Delight (1872), Nuggets And Dust Panned Out In California (1872), and Cobwebs From An Empty Skull (1874). In 1877 Bierce worked as an associate editor of the San Francisco Argonaut, a weekly paper. With Thomas A. Harcourth he wrote The Dance Of Death (1877) under the pseudonym William Herman. In the late 1870s he tried his luck in the mining business in the Dakota Territory without success, and returned to San Francisco to work for the Wasp. 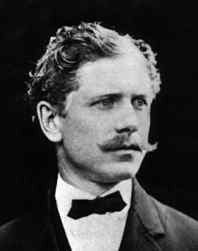 Bierce joined later the San Francisco Examiner, which started his long career as a columnist and contributor to the Hearst publications. Between the years 1887 and 1906 Bierce wrote his famous column The Prattler, which was a mixture of literary gossip, epigrams, and stories. Bierce gathered his sardonic and cruel epigrams and aphorisms in The Cynic's Word Book (1906). When he edited his twelve-volume Collected Works (1909-1912), however, he changed the title of this work to The Devil's Dictionary (1911). In 1896 Bierce moved to Washington, D.C., and contributed to the New York Journal, the San Francisco Examiner, and Cosmopolitan magazine. Bierce's marriage started to fall apart, and he had problems with alcohol. His son, Day, had run away from home at fifteen. Day killed a rival suitor of a sixteen-year-old girl, and committed suicide. His other son died of pneumonia at the age of 26. In the 1890s Beirce published some of his best works, including Tales of Soldiers and Civilians, which included Bierce's most celebrated tale, An Occurrence at Owl Creek Bridge. In 1904 he divorced and broke completely with his family. From 1900 to 1913 Bierce lived and worked mainly in Washington. Among his friends and drinking companions was H.L. Mencken. Late in 1913, at the age of seventy-one, Bierce retired from writing and went to Mexico, to seek "the good, kind darkness." He vanished mysteriously during the civil war. From Chihuahua he posted a letter which was his last. A fictional account of his last days is given in the novel The Old Gringo (1985) by Carlos Fuentes. One entrusted by A with the secrets of B confided to herself by C.
24 stories of horror and the supernatural, including "The Death of Halpin Frayser," "Moxon's Master," and "The Damned Thing," prefaced by a biography of Bierce's life. A satirical, bitter "dictionary" filled with sayings and definition relating to Satan and evil. A satirical retelling of classic fairy tales. The story of Carter Druse, a sentinel in the Civil War, who falls asleep while on duty. He awakens to an enemy soldier on a horse before him. After the horse falls and its rider flies through the sky, Druse realizes the rider was his father. Set during the Civil War, the story of a man about to be hanged for treason, who dreams of his escape. When he is thrown off the bridge, presumably to his death, the rope holding him breaks, and he begins his escape, heading for home. A collection of ghost stories by Bierce. The story of an officer who consistently ignores his own safety, eventually leading him to make a noble sacrifice.